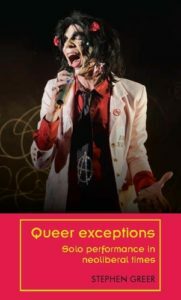 Queer exceptions is a new study of the contentious relationship between performance, individuality and the demands of neoliberalism, featuring established and emerging artists from the worlds of live art, theatre and stand-up. Sara Ahmed’s The Promise of Happiness. Early in the project, I found myself in an archive in London sitting opposite tabloid journalists using the same collection to dig for dirt on queer activists from the 1970s. It made me think very carefully about the kind of history I was narrating in my own work. First drafts are written wherever I can get down words: notebooks, my laptop, post-its and sometimes Twitter. After that, a computer with the largest screen I can find. I’d read a number of other books published by MUP – including Gabriella Giannachi and Nick Kaye’s Performing presence: Between the live and simulated, and Jen Harvie’s Staging the UK – and thought that it seemed a great home for a project rooted in theory, history and practice. A history of Live Art in Scotland. Share drafts early and often: you’re a better editor when you have an audience. Category: Art History, Author Q&A, Theatre Studies	0 Comments.